Precursor T cells mature in the thymus. The mature naïve T cells (also called T lymphocytes) then circulate in the organism. They can be either CD4+ or CD8+. Each T cell is specific for one non-self-antigen, whose encounter will be recognised as a threat and activate the immune response. The T cells recognising self-antigens have been eliminated during the maturation in the thymus. The first one is the engagement of the antigen specific T Cell Receptor (TCR) with the antigen. The peptide is bound to the Major Histocompatibility Complex (MHC) at the surface of an Antigen Presenting Cell (APC), usually a Dendritic Cell (DC). 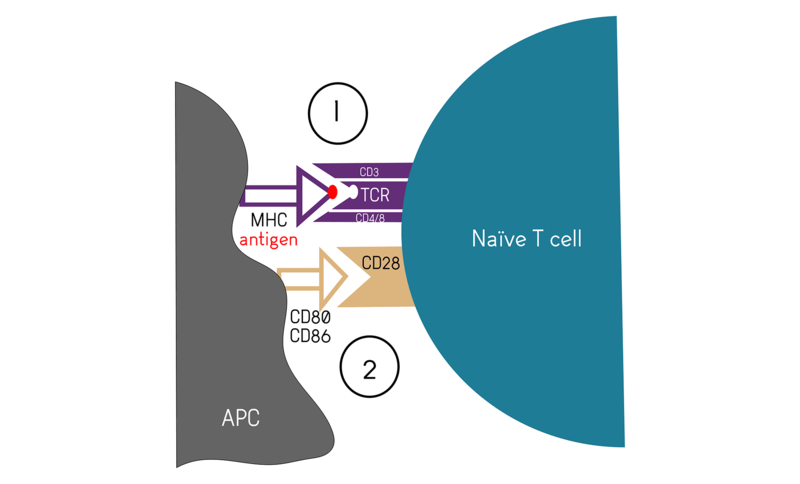 The TCR is part of a complex including the CD3 and CD4/CD8 (Figure 1A). A second, co-stimulatory signal is needed to activate helper CD4+ and cytotoxic CD8+ T cells. There are several and many co-stimulatory factors, the figure 1B presents the main one, CD28, as it is used as a positive control together with CD3 for in vitro T cell activation assays. A third signalisation via cytokine is not mandatory for activation, but will determine with subset of responder the T cell will become. The TCR, CD3, CD4/8 and CD28 are constitutively expressed on T cells. The DC expresses the co-stimulatory molecules only after having encountered and uptaken a non-self-cell like a tumour cell. Therefore, as the first signal is not strong enough to elicite an activation of the T cells, an over-reactivity is avoided. In drug development, and especially in oncology, it is often important to understand how new compounds and therapeutic antibodies can interact, enhance or inhibit T cell activation. 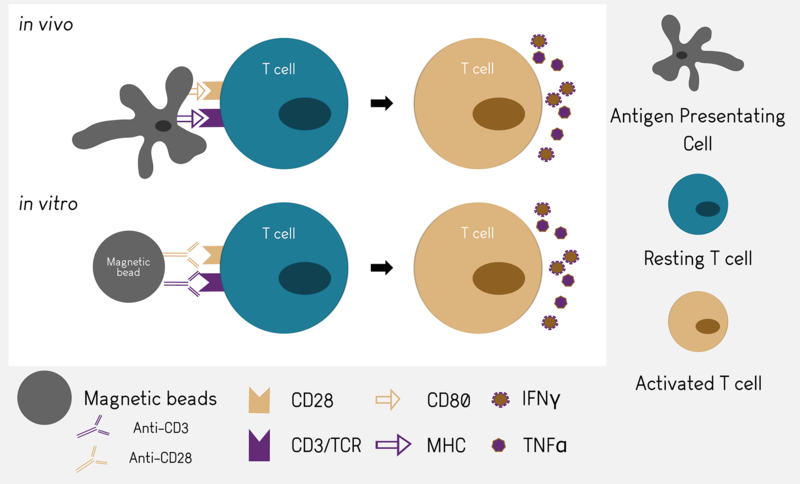 The T cell activation assay use magnetic beads coupled with anti-CD3 and anti-CD28 antibodies as positive controls. Those antibodies will mimic the binding to MHC and CD80 and trigger the cascade of activation of T cells.